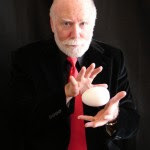 Steve Cambian and Peter Pitchford will be among those dazzling the audience at the 2010 Cavalcade Of Magic! Other award-winning magicians will also be performing to amaze the whole family! October 16, 2010 at 2:00 p.m.